Ron walters needed a bit more space for the pulleys of his lathe on his workbench. 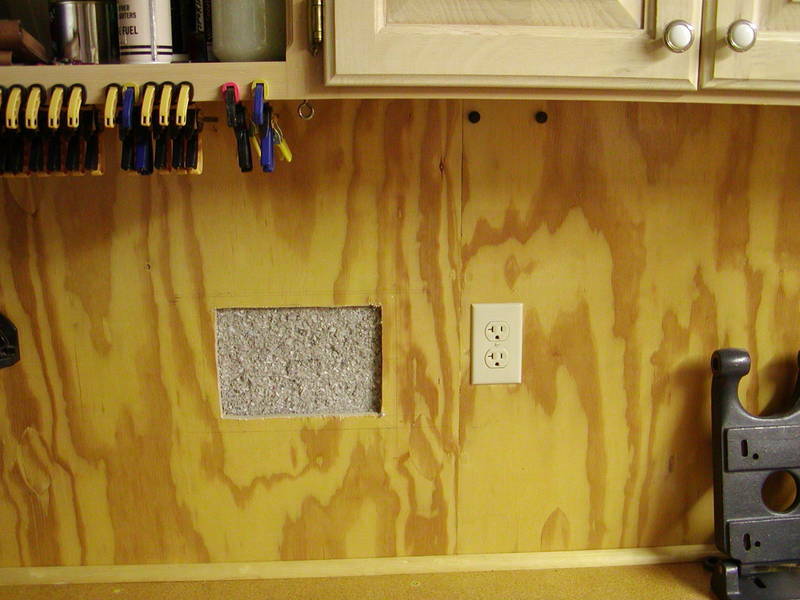 His solution: Cut a hole in the wall to make room. 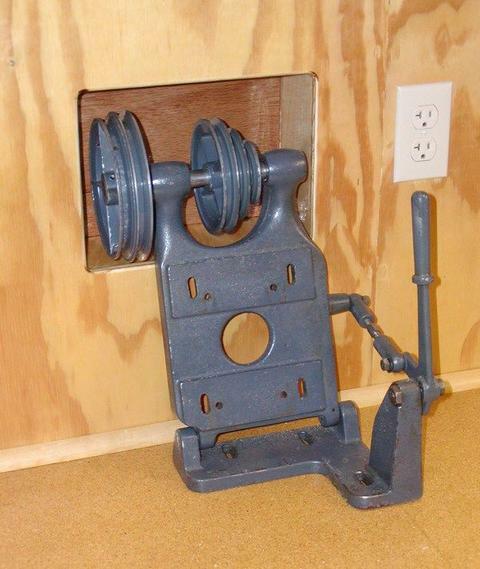 I bought an old Logan Lathe, which has a separate mechanism for the motor mount. The mechanism provides a means to quickly change drive speeds and it tightens the lathe drive belt. 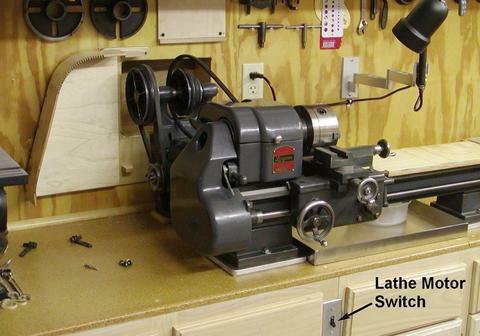 I did not have enough depth on the top of my workbench for this mechanism and the lathe... but I really wanted the lathe on that workbench. So I thought about cutting a hole in the wall to provide clearance for the pulleys. That's all the additional depth I needed. 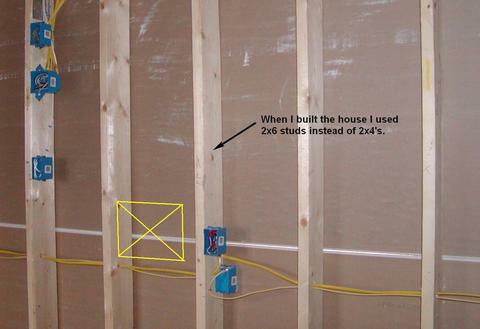 Fortunately, I took photos when I was building the house so I knew where the studs were and more importantly, where the wires were. 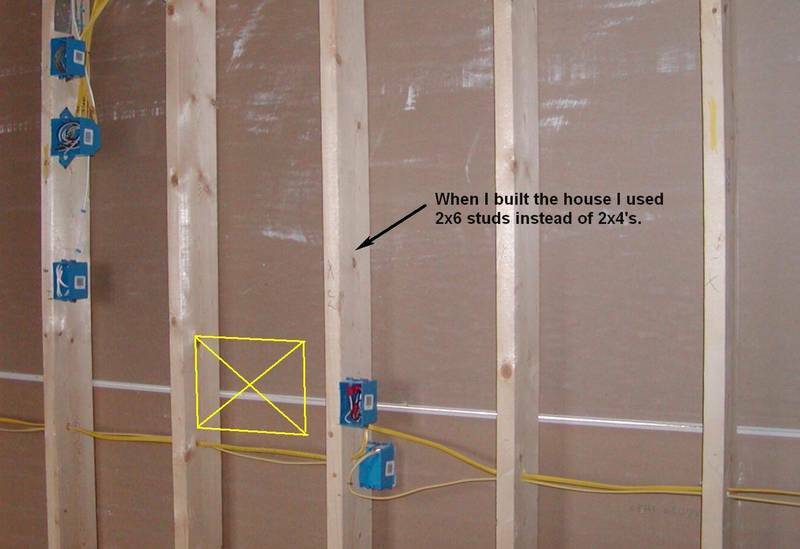 The walls in my house are 2x6. I paneled my workroom with plywood for obvious reasons. The other side of the wall is drywall (which is one wall of my house garage) so I had to be careful. 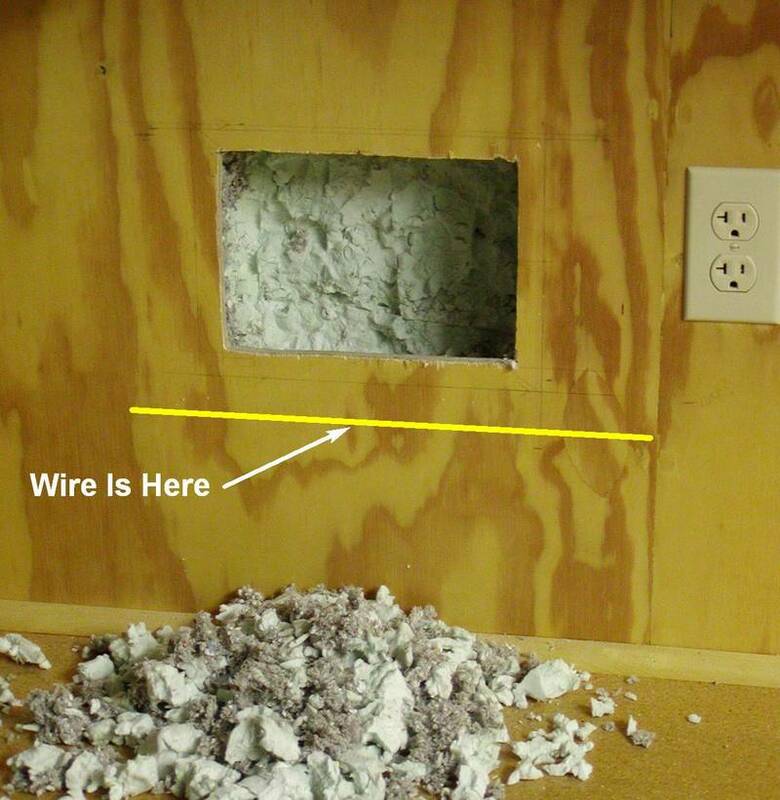 First, I marked the hole location on the wall, rough cut the hole a little smaller than required and chewed out the foam and cellulose insulation. Then, I looked for the wire to make sure it was where I thought it was. I didn't remove any more foam insulation than I had to. I made a template to route the rough-cut hole to the final size. Carpet tape held the template temporarily to the wall paneling. 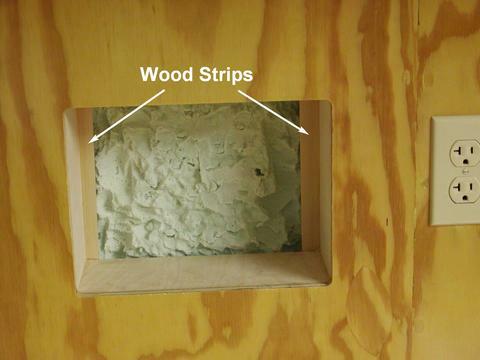 I inserted the pieces of plywood, which formed the sides of the box, gluing them to the backside of the plywood paneling. 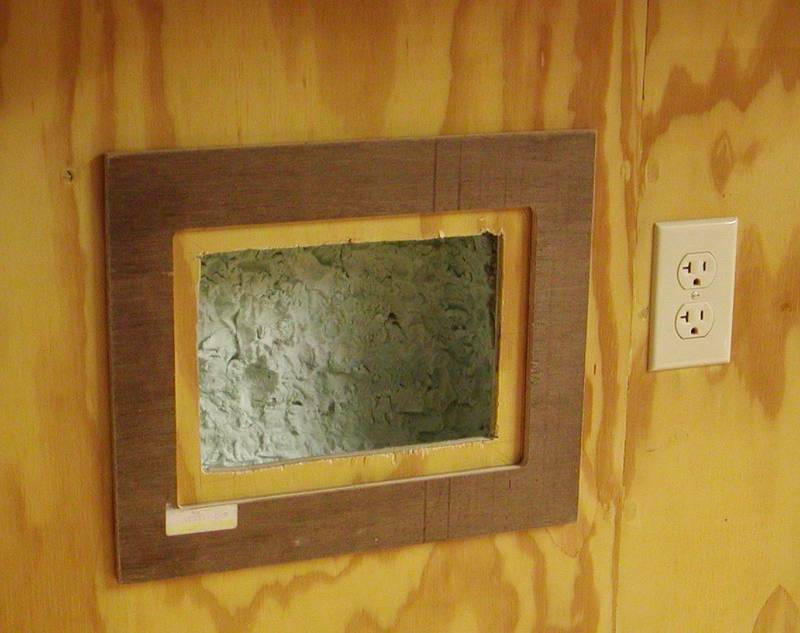 I glued the bottom one first making certain it was level and square and clamped it to the backside of the plywood paneling. When the glue was dry I installed the two sides, squaring them to the bottom piece. Last, the top piece was glued to the two sides and to the plywood paneling. I glued two wood strips across the back (see photo) to stop the piece of plywood I would push into the hole to serve as the back of the box. 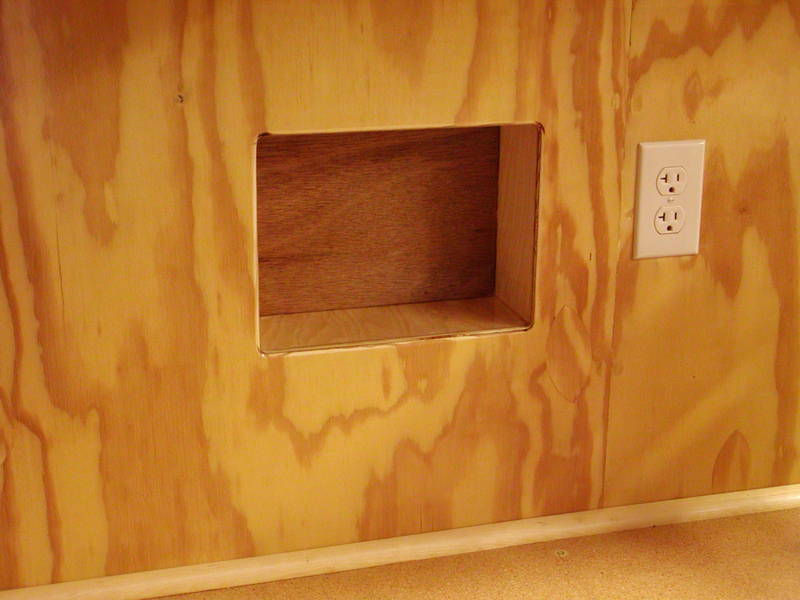 I used a flush-cut bit to even the edges of the plywood paneling with the sides of the box and then a round-over bit. I varnished everything with oil-based polyurethane to match what was used on the paneling. Fairly tedious... took several days waiting for glue to dry, etc. Then I made a belt guard which swings out of the way when necessary. A pin (a double head nail cut off) locks it in the closed position. It just keeps fingers and stuff from getting into the motor belt. 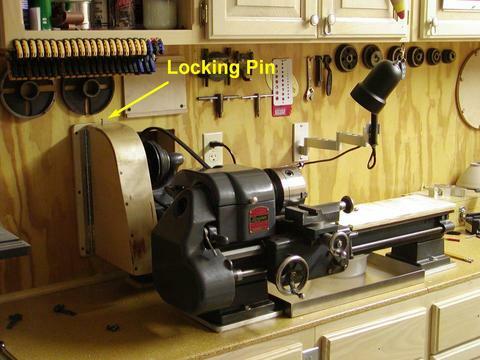 The other belt is well behind the lathe and is not really dangerous. You aren't supposed to be messing around with the belts until everything has stopped anyway. Reaching over a running lathe is a Definite No No! The switch for the lathe motor is between the two drawers in front. The lathe motor plugs into the wall outlet next to the belt tightening mechanism, so there is no reason not to unplug it before working on anything. You can see the notches cut into the belt guard plywood (click image to enlarge). The curvature was gentle enough that the plywood easily bent into position. These notches got filled with epoxy to strengthen the guard.